The dipole is OK on 20m and 15m and very easy to change bands. 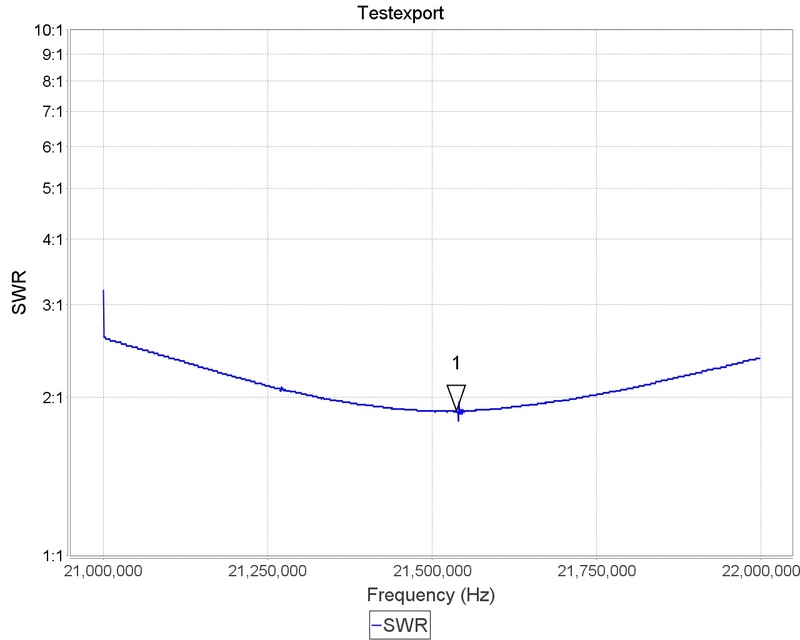 Initial quick test shows this is for 15m, 20m and the others are better. Going to the beach tomorrow brrrr... yes will be cold. I have my vertical dipoles that I have had fun with in KH8 but I always wanted to build a /P multiband dipole where the 1/2 element is made up of resonant sections that are switched in or out. 10m,12m,15m,17m and 20m. There are multiple ways to connect the sections but I figured that probably the most effective was to make a dipole that was for 10m and then to add a section for the next band prune and move onto the next one, the connections between the sections I will be using Anderson power poles (as I have just located a small bag). They 'remake the connections each time so the antenna should operate fine. I have called this the LoStRoPo multiband dipole. Sotabeams kindly provided a couple of winders and the dipole arms fit nicely. I used RG174 and some liquid tape on all the centre connections (again sotabeams). I used some braided yellow string on the ends. 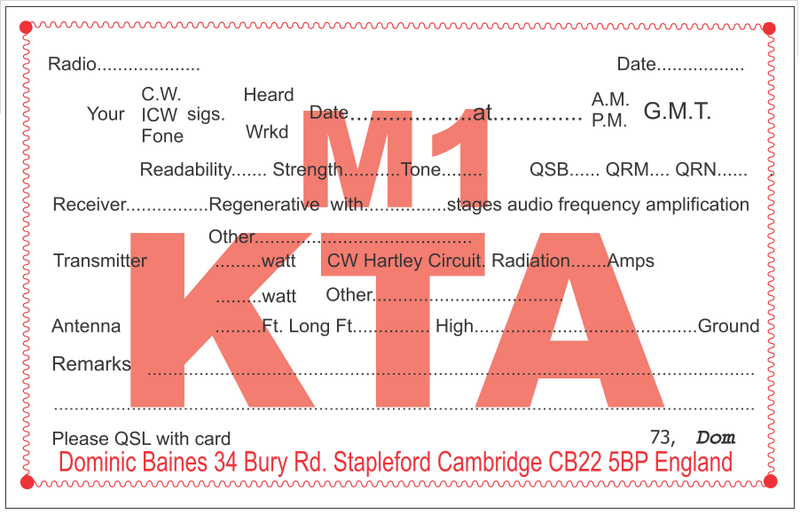 Will see how it does tomorrow....will be set up as an inverted V using a 10m pole or as a vertical dipole I will use alongside the kite antenna with the KX3. I add photos and VSWR plots later. That is 50m of line, 41metre long wire and angle of kiteline and wire hanging beneath it is about 60 degrees. .... stays up for 25 minutes and then floats down as almost no wind. The kite is held in place with 200lb braid attached via a carbineer and a sling to a dog tether. The Antenna wire is also attached to a separate dog tether, the line between the two with the red cylinder is a static discharge line that has a 4mm stacking plug at one end and croc clip on the other. No radio connected but just wanted to test the setup.... was a bit anxious as low wind but once the kite caught it... up up it goes. Note the leather gloves these are 100% essential even in light wind the line can cut through flesh very fast! By the performance today in stronger winds (hand held anemometer coming) this kite will generate a lot of lift. Off to the beach tomorrow with a backup antenna to test out 80m and 60m with it. The major problem with a kite antenna... no wind no antenna. It got to about 10 feet AGL (no antenna connected) but came down again. Still it looked good and the angle was steep. Wil go to beach tomorrow with 'normal' antenna too. Expect to be qrv 15m, 20m and maybe other bands if the antenna goes up. Made up a unun for the kite. I am afraid not terribly scientific just a current balun. I just grabbed two colours of 18swg enameled wire (the enamel comes off under extreme heat) and a T200-2 and bifilar wound about 23 turns on it. I known that the more turns then 40m and below 'likes it'. I wrapped the T200-2 with electrical tape first. There are loads of circuits on the web for an unun so I'll not repeat it here. RG58 was used and I had to fiddle a bit to get it to fit, without prodding it about. I used some random terminals. The RF ground side is bonded to the tin in several locations. I'll have a separate antenna wire to ground lead, croc clip with some megohm resistors in as a static bleed. The tin is a Swiss lozenge tin from 2007, yum finished thee sweets first then washed out the tine with acetone. I like these they are same size as an altoid but twice the depth so a T200-2 will fit. The card on the base is from Starbucks one of the olympic 2012 cards they had at the time I pick up a few every time I visit as they are useful for all sorts of insulation tasks and they fit the bottom of the tin. As I expect will get a bit of use/abuse I have hot melt glued stuff together. The matches an unbalanced antenna to an unbalanced feed no transformations. I have been messing about with flying antennas on the beach from a kite for a bit with mixed success and though it was time to get something a bit better and bought one of these. 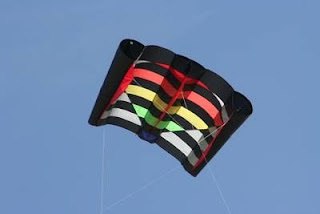 It has a 6 foot span and seems to be a decent single line kite. I have also taken advise and bought some Superbraid electric fence braid (keeps sheep in the field type) which is 6 x 0.2mm tinned copper conductors within a monofil polyethylene rope. So it is strong AND it doubles up as the kite antenna. Must remember leather gloves though. Easter w/e so I am sure I'll get up to The Goggs close to where I live or maybe the beach near Kings lynn and have a play. I might even take the KX3 along. Going to solder a series of 1Mohm resistors across a piece of PCB in a small box with some terminals to act as the earth leak circuit between the antenna wire and ground BEFORE it goes near the KX3 to provide a static discharge. The tubes are early triodes type 10, 27 or 45 the 1st and last are 4 pin the 27 is 5 pin. The full numbers should be UX-210, UY-227, UX-245 the sockets I think were known later as UX4, UX5... the 'correct ones' I need (saw them at Dayton 2008 in flea market for 25 cents and I could kick myself now for not buying them) are about 1 1/2" square base with a black central cylinder that the valve plugs into. Finding a tube let along a working one from 1920's is hard enough, and I have someone from US that has found some of each for me... old globe style not shoulder ST so it should have the vintage feel :-) I have some '27 arriving soon. I have the sprague lozenge capacitors, 1/4" copper tube, resistors (fabricated something) and the variable capacitors (I think they might be WWII vintage so a bit new but they are the right sort hihi)... but cannot seem to locate the valve bases or a couple of beehive insulators for the coils so I will fabricate some from a block of PTFE and paint brown until I can find originals. 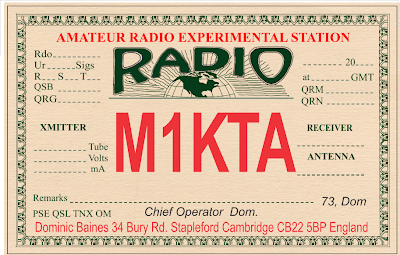 I even have some vintage 1920's style QSL cards using the same orange/red, card stock. Even though I have a modern call they 'look' like from an old experimental station. Power should be c2W so perfect for qrp and perhaps GQRP winter sports or one of Colin's G3VTT valve days. The power supply will be a simply transformer with another type 27 valve used in it. Makes a change from all the silicon stuff in the shack and workshop. They seem to have gone up a bit since I bought mine at £9.99 each now at £12.99. They are great for 20m-10m verticals and can be used and this starts to become a compromise antenna from 30m, 40m and on down to 80m with base loading and can take a dipole or long wire (I use a W3EDP with mine) if the wires are not heavy the top sections will bend a lot otherwise! Check out http://www.nonstopsystems.com/radio/frank_radio_antenna_80m_vertical.htm whose webpage put me onto using for 80m intially. My base loading is a lot less elegant and is usually using whatever plastic drinks bottle I can find and a KD1JV Deluxe Antenna Tuner http://www.qrpkits.com/deluxetennadipper.html and a couple of tap points to get the vertical approximately resonant. You will need a tuner (AMU) to operate and a couple of radials. I use a couple that are made from two sections of about 11m flat ribbon cable which have the wire left in situ but cut out for 10cm or so for resonance at the CW end of 40, 30, 20, 17, 15 and 10m). The ribbon cables are 8 wire I have the outer two resonant at 14.275 and 21.275 (The later was using to good effect in 6W on AF-045). If you can it is better to have the radials RAISED at the feed point and the ends tapering to ground. Not 100% sure of ther theory but experience says this does make a difference. The RX signals and reports tend to be better in the direction of the radials. I often do not put them out 180 degrees apart and the antenna is more of an L with two legs if that makes sense. The two radials could (but I have never used them for this) be used as dipoles. I was asked how I secured them... well I have become a fan of some plastic ground screws but I have also found that you can use patio table parasol bases. Beaches often have these somewhere. I will only be having a go today so not even a 12 hour entry and qrp with kx3 but I have put up a few antennas. The two vertical dipoles from KH8 on 15m and 20m along with my qth vertical 10-80m and thee 140ft long wire that will tune most bands. The antennas all come into the shack though the window with coax balun on the two dipoles. The 140ft long wire comes down over the 4" pipe off cut into the window. 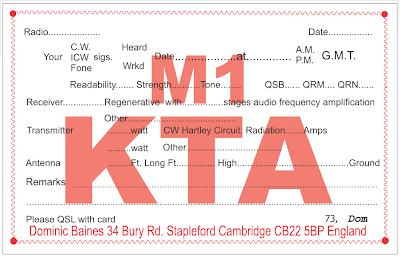 Not huge number of contacts 15 (11 on 15m, 4 on 20m) in first 2 hours all uniques 2 HQ stations and 11 DXCC. I have heard some VU, VK and ZF2XF but have not worked them yet. Given up on RSGB BERU... sat in queue waiting to work VY2SS for 30 minutes no fun! This is just the base sections. Not just me doing the QRP thing on the beach and if you want to know what it is capable of this is an exchange I had with Pete M3KXZ. I was a little late getting going this morning, thanks to bad night's kip (dodgy back!). 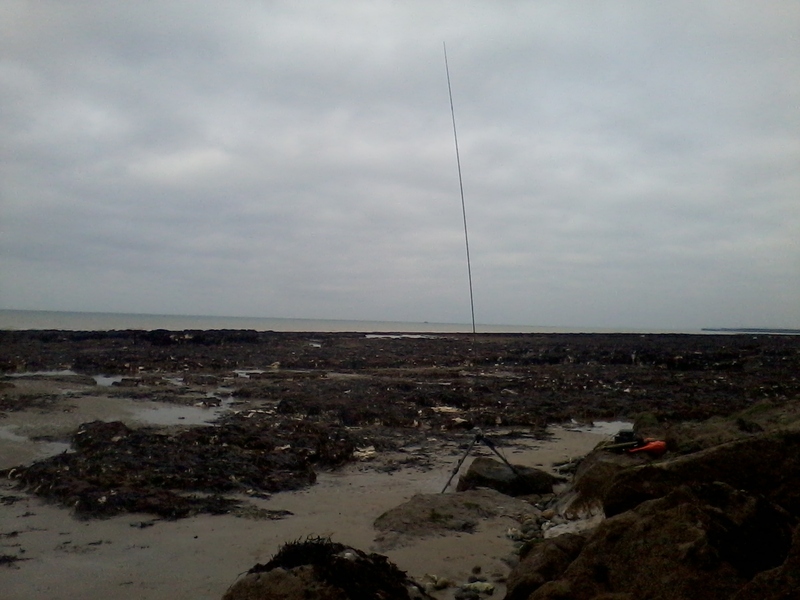 But, I finally managed the 2 minute drive to Rottingdean Beach with the dogs and got down there at 0830UTC. Set up the gear by 0840UTC and tried to find VK6PTU and G6UOI who I was hoping to meet around either 14220 or 14185 but no luck. Heard VK6LUD on 14235 in convo with a G. Also heard VK2CR in convo on 14180. Kept listening back and forth between the two. As soon as VK6LUD finished, I pounced and we had a great 10 min QSO from 0846UTC. Rob was pretty gobsmacked when I told him I was sitting on the beach and running 2.5W into a vertical whip. Smashing - I was dead chuffed. My head was now spinning. 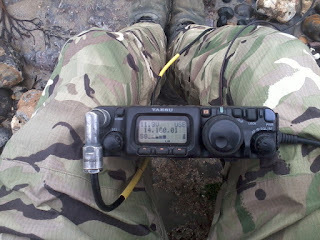 On 14218I heard VK6WC just finishing a QSO and again. I pounced and tail ended it. Another fantastic QSO at 0906UTC.. Reports again 53 and 59. Wicked! After this half hour I was feeling a bit chilly and needed to get the dogs home. I had one final QSO with IZ0VXY/P who was activating the castle Castello di Prossedi. 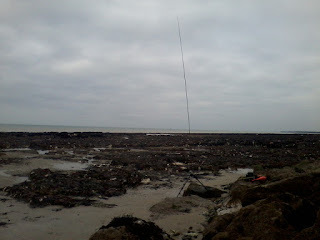 Vertical on 20m what radials, raised or just laid on pebbles (know you have not got sand). It was just to simple to set up - just fed the 5 metre tall whip against a 3 metre long counterpoise wire that just sat on the ground. 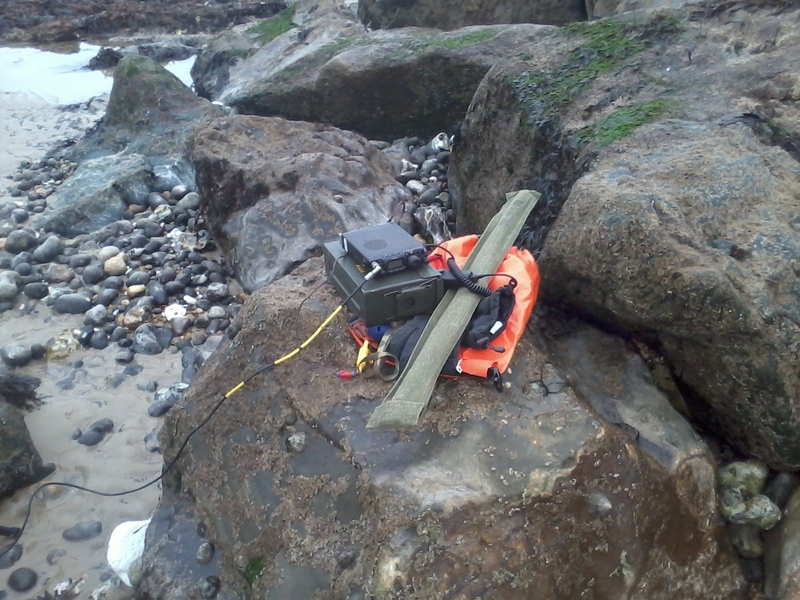 Tuner right at the feedpoint to match it to the coax, matched easily and off I went! 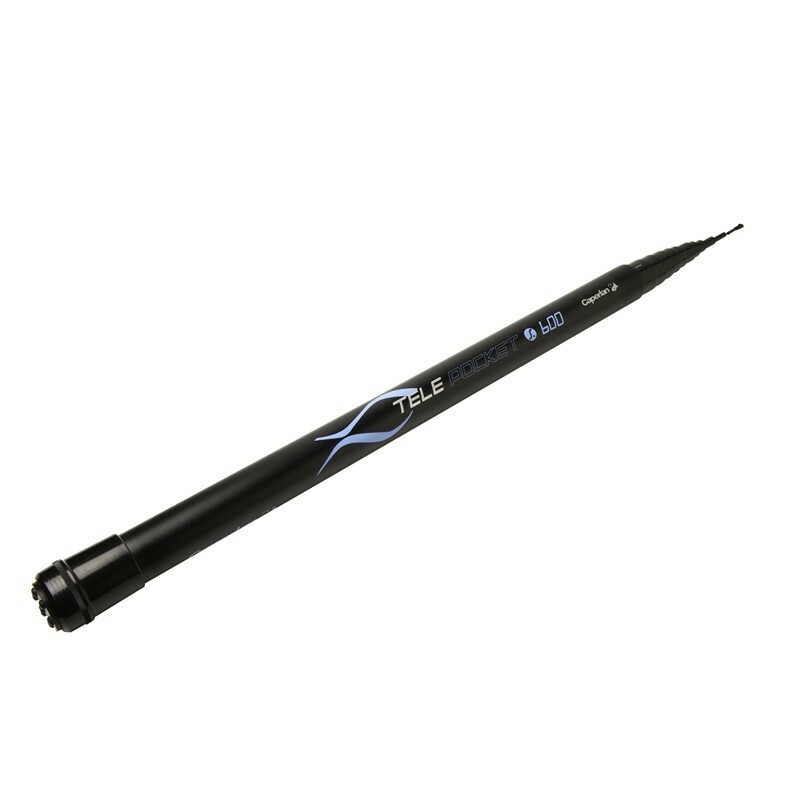 Also easily matched on 40, 30, 17, 15, 12 and 10 using the Elecraft T1. No balun/unun this time - just used one of the BNC to terminal adapters that I got from G3CWI. 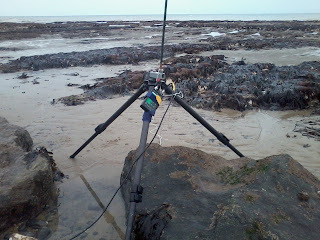 Tripod is carbon fibre so isn't too worried by salt water. Here are some pictures. If you look carefully you can see some sand! The white wire is the counterpoise. View of the whip. Slightly wonky horizon in the background, and on the right hand side is Brighton Marina just poking into the sea. My pile of /p stuff. Antenna rods go in the canvas holder, LiPo batteries and charger go in the ammo tin and all the other stuff goes in the orange dry bag. Rig showing received sigs from VK2CR. He was peaking over S9 as were the other two. I really need to get a phone with a decent video recorder and would love to be able to record QSOs like this. Hope all well with you. Dom, Just realised a mistake in my power out for the CW CQs.... or course low power is 500mW, not 100mW! So only 8,000 m/W - oh well. Brilliant photos you blogged these anywhere? If not do you mind if I write a post on mine and add them with your words? 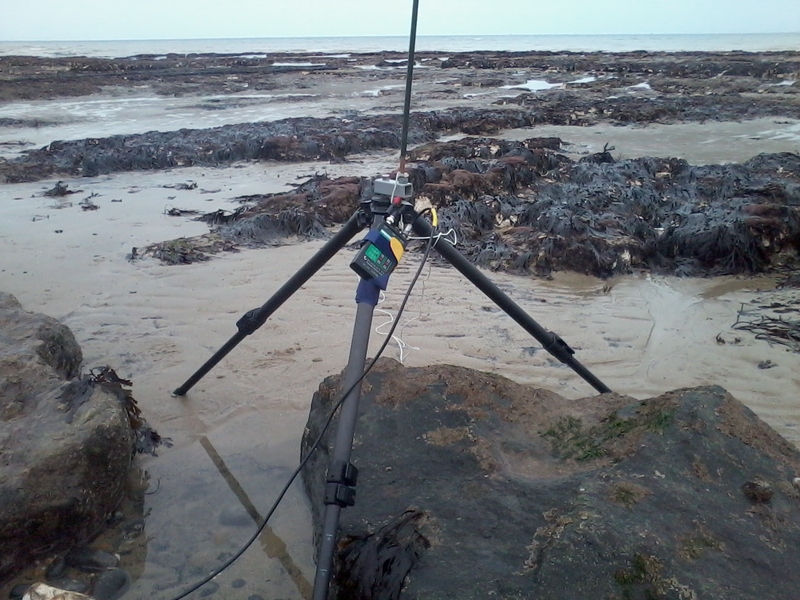 I just love the idea of beach qrp as we both know it works and your setup is great and looks so simple. The whip where did you get that and the coax looks like same source as the pants you can almost see a MOD number :-) ? I've never got round to setting up a blog, and not sure when I'll get a chance to, so please feel free to post everything on yours. Attended this today and saw a few old friends and had a few pop up and say hi. Apologies if I did not immediately recognise you. Picked up a copy of SPRAT Book from RSGB stall. Steve 9M6DXX has done a great job. It is a really nice read. The designs include some 'classics' but the book does not mention that some include obsolete or 'hens teeth' components that might challenge the constructor. I had most of these on the buro pile ready to go out.